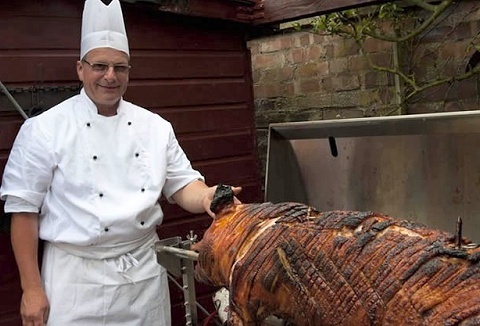 We provide a hog roast service with succulent lamb, pig or poultry roasting on the spit. Choose from hog roast to alternative meat menus served by chef & staff. Why not hire either a hot potato oven, candy floss or popcorn machine to complete your event. 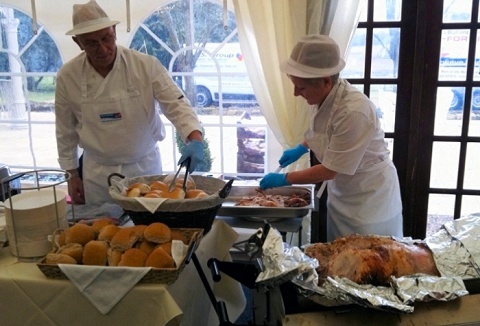 Watch as our fully trained and uniformed caterers with fresh ingredients, quality products roast to mouth-watering perfection your chosen meat of pig, lamb, chickens (plain, piri-piri or lemon), turkeys, sirloin or topside served with salad & fresh rolls. 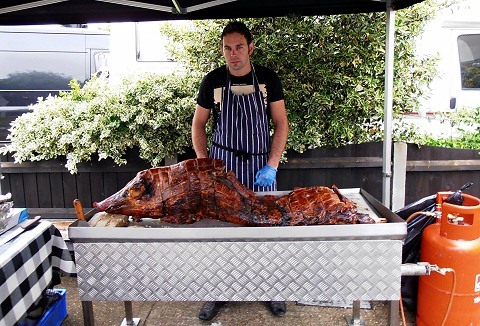 Specialising in spit roast and barbecue catering for any corporate event, celebration or wedding. We use traditional spit roasting equipment & commercial barbecues to bring out exceptional great flavours of outdoor reared pork, lamb or free-range chicken. We offer a complete service including starters and desserts if required. 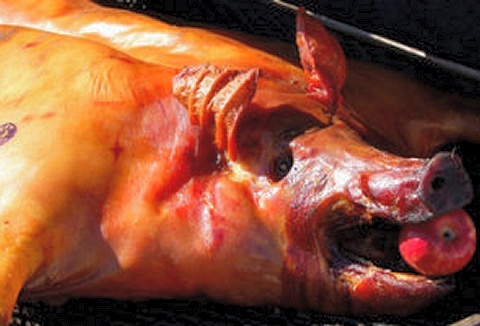 Our hog roasts are served hot straight from the spit and we use only the finest local meats and products. Professionally trained uniformed staff to carve and serve. Various packages. The absolute purest outdoor bred free range pigs gently roasted provides the ultimate hog roast experience. Carved by our chef and all served in fresh baked baps with Bramley apple sauce, sage and onion stuffing and topped with crunchy crackling. 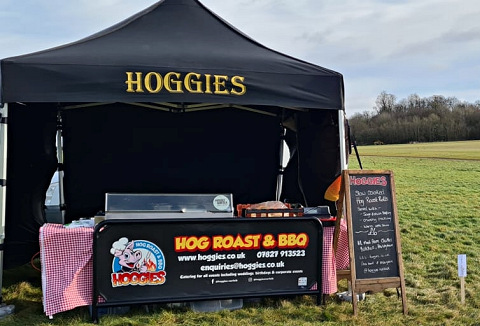 Our catering kiosk trailers, hog roast ovens and BBQ grill units all operate from under a gazebo where we serve our sizzling pork hog roast and crispy golden crackling, speciality Lincolnshire sausages and burgers. Fast food catering for your event. Our pigs are outdoor reared free-range, rare breed saddleback pigs. We slow roast our pigs to ensure the crackling is spot-on which in turn compliments the pork when served alongside our homemade stuffing and apple sauce. We attend all types of events. We offer a service that can be tailored to suit your requirements, whether your holding a village show, charity event, private party, a corporate hospitality or wedding. Choose from our menu of quality meat, whether a whole pig, just joints or BBQ items. We provide first rate barbecues or hog roasts with any outdoor function and will tailor any occasion to suit your own requirements. Our extensive experience as quality caterers ensures that a professional approach is taken from the very first enquiry.